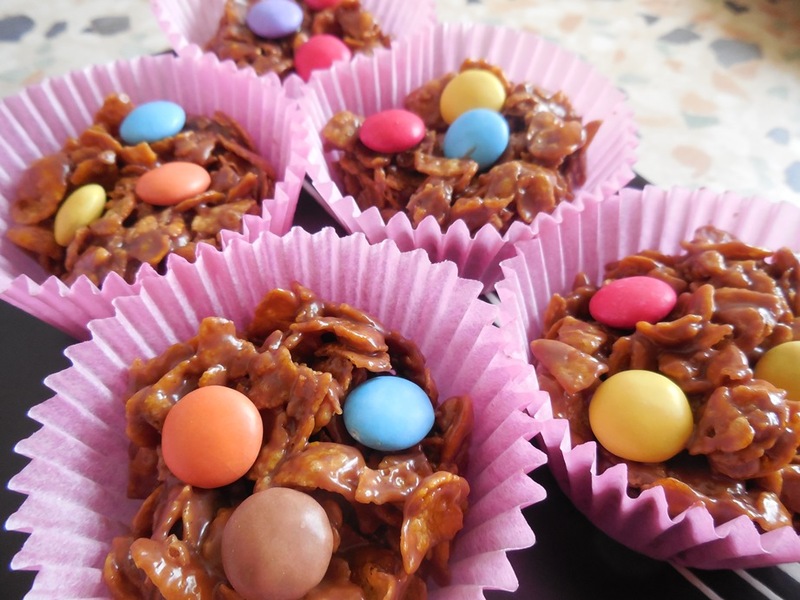 Who would have believed that cornflake cakes would be my first blogger’s hurdle?! Well, it’s only taken me three attempts and although I really wanted to make these as an Easter treat, I have finally managed to produce a batch I am happy with. Thank you to my mother-in-law Carmen from who I have adapted this recipe – I think it is awesome and I hope you agree! Place 12 cupcake cases into a muffin tin. Chop up the mars bars and put them in a saucepan with the butter. Add the cornflakes into a bowl and stir in the melted chocolate until all the cornflakes have been covered. Using your hands make 12 cornflake balls and place them in the cupcake cases. Add three Smarties on top of each cupcake case. At Easter time, you can try using mini eggs instead of Smarties. I tried the mixture with bran flakes after my first successful attempt and they were awesome too!